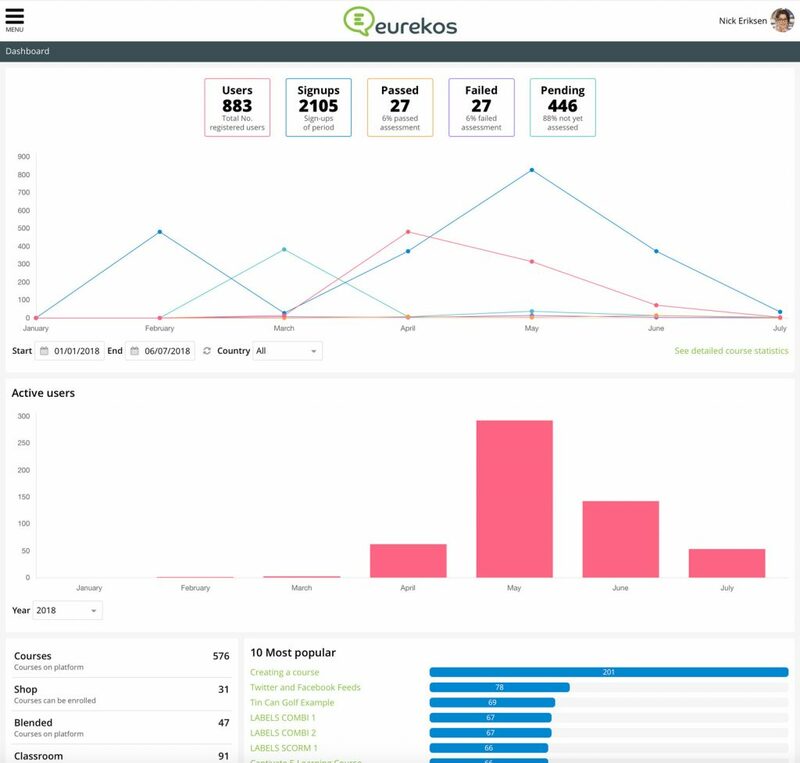 It was a pleasure to demo the product and put together this Eurekos LMS review – it’s a great tool to help you create, curate and manage content quickly. An excellent learning management system for busy training teams that want software to make their jobs easier. This is an LMS with some real attitude. The attitude is all about making it quick and easy to create and curate content in the LMS. And yes Eurekos has put an amazing level of thought and detail in, making it incredibly easy for the busy training team to create and manage content. It is not bluster either – they have some pretty compelling evidence that this platform can build out content quickly and easily, and over a detailed 2 hours or more demonstration, the case is pretty compelling. Eurekos appears to have learnt a lot from leading software in other sectors, and one of the real reasons the LMS allows such speedy content development is that collaboration and control (project management) is made so easy. Multiple authoring and multiple reviews of courses are possible, and the ‘Masquerade’ feature allows for courses to be viewed from differing perspectives. The authoring interface is very very intuitive to use, icon driven, and with a library of templates to use, the creation process is made easy from commencement. Course design tips are added in as well. However, my favourite feature (and one that will really make collaboration work) and prevent development scope creep is the ability to visualise the course structure clearly and succinctly, as shown below. As you can see: A course with its modules, units, chapters, sessions etc… can be modelled and created in outline quickly and effectively, so common understanding and structure is quickly developed and shared. I love this simple but effective way of managing a course in all its component parts. H5P enables existing CMSs and LMSs to create richer content. With H5P, authors may create and edit interactive videos, presentations, games, advertisements and more. Content may be imported and exported. All that is needed to view or edit H5P content is a web browser. Rich content, applications and content components may be shared here on H5P.org. And it is free to use, and works very well indeed when fully integrated into Eurekos. The content build process is fully Responsive Web Design from the outset, so time is saved in not having to check back against differing screen sizes as part of the dev process, again shaving time and making life easier for the dev team to focus on the actual learning interactions. Dynamic links are used to create and manage links with one click inserts – again saving time when using Eurekos. Content can be quickly cloned and re-used, and links are automatically managed. This benefits updates and allows courses to be re-purposed quickly and effectively. Eurekos is not just for creating content, it is about managing content and is excellent in managing Volatile Content, perhaps one of the most challenging segments for the learning industry. Content is auto-tagged and archived materials allow for courses to be quickly and easily returned to the previous iteration. This is useful if a one-off iteration of a course is required for specific reasons and then a return to the master version is made quick and simple. Specialist courses can be created, Eurekos supports courses that use TeX (latex)….check, ASCImath and code snippets for software coding courses. Slick Image and Video management. By using Amazon Cloud Front, Eurekos allows for great flexibility when integrating videos into courses. Amazon Cloud Front offers enhanced delivery properties in low latency and bandwidth situations. But Eurekos have integrated Amazon Cloud Front in the LMS to allow for “bookending” of generic video content with custom content created in Eurekos. Image editing is made easy with an online image editor built in to Eurekos. 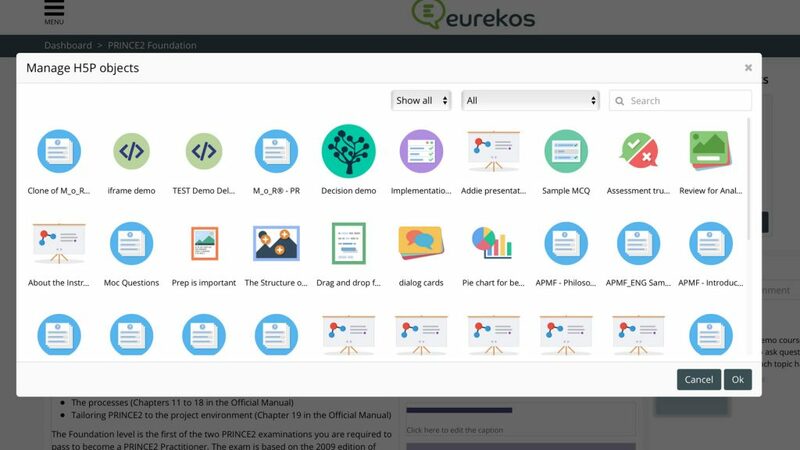 So, I have no doubt that the claim made by Eurekos is true….. that this platform really does save time in creating and curating all manner of materials for use as learning materials. The level of thought that has gone into the design process is exceptional, from course structuring to one-click links and the integration of H5P and a host of other smaller details really makes this platform swift in creation and smooth in delivery. From swift to smooth: as you probably guessed, there is quite a lot more to this platform and it comes with several really useful features that will enhance the user experience as well. 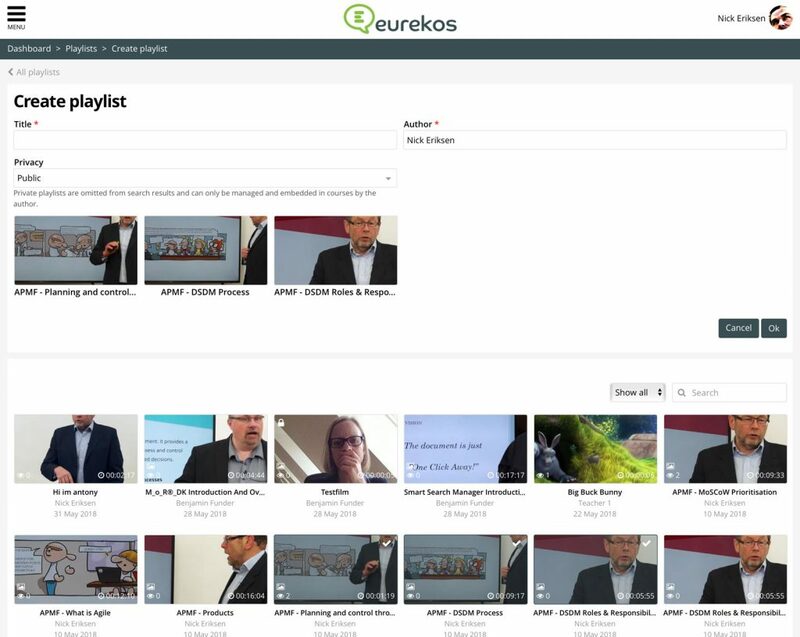 Eurekos can create and deliver play lists of learning… something akin to the Netflix style of delivery and accordingly the User Interface (UI) is very smart and smooth from the get go, so the effort (and there is still some…) in creating your high fidelity courses is not wasted. The learner experience is underpinned by well-integrated social media connections, again driving engagement. The overall experience is clean and dare I say it…. smooth Scandinavian style, in that effortless ergonomic design one associates with Denmark. 11 languages including Arabic are supported at present by Eurekos, with a very clever translation interface built in, and more languages can be quickly added if required. For the LMS administrator this is a pretty powerful LMS, but not of the corpulent and overwhelming style of some I come across. As we have discussed, content creation and content management is well thought through. Learner management is equally well thought through. Classroom and online training can be managed and scheduled, and there are integrations with Google and Microsoft to ensure that this can be done quickly and smoothly. Classroom location management is supported as well. A Go To Meeting webinar can be scheduled by Eurekos. Integration and single sign on is covered. For the sophisticated administrator, email communication can be fully customised quite easily. Certificates can be easily created and a useful certificate management feature allows for expiry alerts to be used as certificates near their end date. Eurekos allows for the creation of many differing roles that can be given a variety of permissions to operate and administer the LMS. This makes for a hugely powerful, sophisticated LMS as the roles can be managed to incredibly prescriptive levels from a “role mixing desk”. Eurekos allows for the easy creation of white label iterations of the LMS (clones, or what is often called multi-tenancy) and courses (in all their complexity of make-up and links) can be very quickly and easily moved into these iterations. Branding is effective and easy to use so client white label iterations can be created on client brand. Finally, in what is a very comprehensive LMS (that is ideal for organisations who are committed to building their own courses and organisations who manage and sell courses) there is an excellent ecommerce solution built in. This presents itself as a highly configurable course store that offers a high quality description function – giving potential customers a real feel of what the course is about and pricing management functions. While Eurekos are justifiably proud of the ability of this platform to build (and curate) impactful high fidelity digital learning courses, the overall ability of the platform should not be forgotten in the need for speed. This platform has a well-designed UI and UX, and is suitable for use by training companies and for inside the organisation. 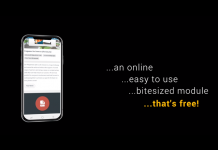 This platform is designed to make content building and content curation for courses or resources slick and efficient without any compromise on quality……….and in that considerable challenge alone, it excels. You can get a free demo of the Eurekos LMS via their website.